Art Blogazine: E-News Magazine update: Reena Kallat. Woven Chronicles, her solo project currently on display at Offsite, Vancouver Art Gallery has intrigued visitors from all over the world. Reena Kallat. Woven Chronicles, her solo project currently on display at Offsite, Vancouver Art Gallery has intrigued visitors from all over the world. 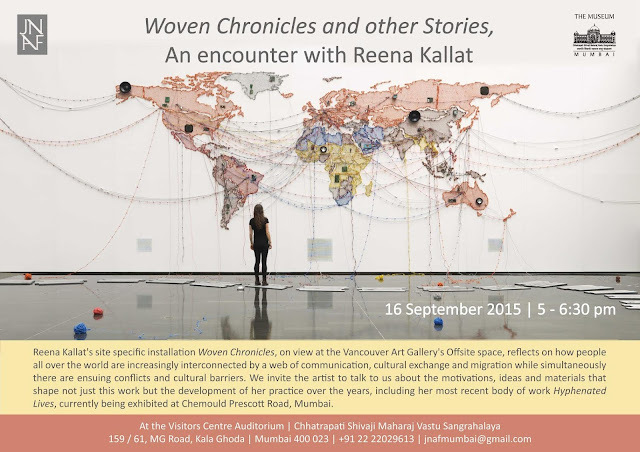 Woven Chronicles and Other Stories, An Encounter with Reena Kallat. Woven Chronicles, her solo project currently on display at Offsite, Vancouver Art Gallery has intrigued visitors from all over the world. Reena uses material very imaginatively imbuing it with conceptual nuances, incorporating drawing, photography, video and sculpture. She will discuss her work, and the thoughts and ideas that inspire it. The programme is part of the CSMVS and the JNAF'S efforts to engage more actively with practitioners of modern and contemporary art and provide a space for audiences to connect with them. Do join us on the 16th of September at 5.30 pm at the Visitors' Centre. Tea will be served at 5pm.